You’ll leave feeling opened up, connected, and maybe a bit shaky, but in the way that lets you know you’re alive and growing. You’ll probably have some new insights about yourself, and some new ideas for how to create more of this experience in the rest of your life. And a bit later, you’ll drop me a note to let me know who you’d like to be connected with, either as friends and/or for a first date. I’ll connect you privately if the feeling is mutual. 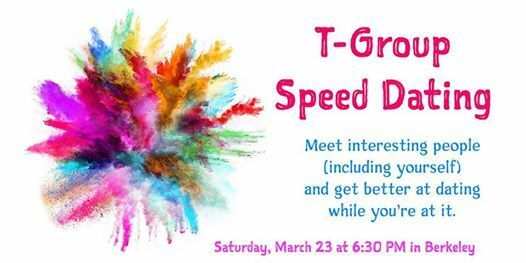 In this iteration of the T-Group Speed Dating, we’ll be experimenting with some one-on-one T-Group practices in addition to the small groups. There have been many requests for this, so I am excited to be able to share these new creations with all of you!